Lions in Gir look for new territories as the sanctuary is not large enough for their population. A LION prowling on the beach? 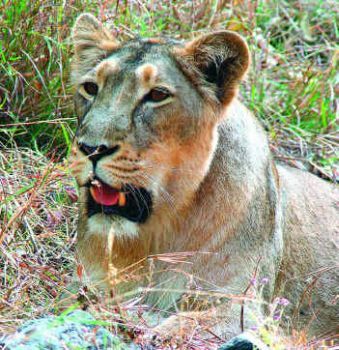 Yes, small groups of the world’s last surviving Asiatic lions have moved out of the Gir sanctuary in Gujarat’s Saurashtra region towards the coastal forests of Diu. They have not disturbed any sunbathers so far. Nor have they attacked people in the coastal villages. The Gir Protected Area (GPA) is simply too small to hold the 327 Asiatic lions that the planet has in the wild, so the younger ones have moved out in search of new territory - as far as Diu, around 80 km away. "It may seem unusual to find a lion on the coast, but this is not the first time that they have reached the shore," said Bharat Pathak, Conservator of Forest (Wildlife), Junagadh. Lions were spotted in the coastal areas in the early 1900s, according to the Junagadh Gazetteer. Now, as the lion population is larger and open grasslands are shrinking, the animals are dispersing as if to reclaim the 2,560 sq km they inhabited until 1956. The GPA is only 1,421 sq km of dry, deciduous forest, a little more than half the original size of the forest. There are fights for territory between lions. The weaker ones step out. There are now three or four lion populations outside the protected area. A pride of 13 lions lives in the Girnar hills, 20 roam the coastal areas, there are 16 in the Hipavadli-Savarkundla region and seven in other places. The number of lions has exceeded the sanctuary’s estimated carrying capacity, according to Dr. Ravi Chellam, an expert on the Asiatic lions in Gir. Chellam’s survey, conducted while he was with the Wildlife Institute of India (WII), recommended that the lions be shifted to Kuno, a forest in northern Madhya Pradesh, more than 1,000 km away. Lions do not shy away when they encounter humans. This often allows close shots. "Just because their population has increased in the last two decades does not mean that the long-term future of wild Asiatic lions is secure," says Chellam’s report for the WII. "If restricted to a single site which is relatively small in size, the lions face many extinction threats - genetic and environmental. Catastrophes like an epidemic could result in the extinction of an endangered species." The WII report points out how a canine distemper epidemic in the early 1990s at the Serengeti National Park in Tanzania affected 75 per cent of the lions and killed 30 per cent, even though there was a large lion population spread over a vast area. "If a similar epidemic were to affect the lions in Gir, it would be very difficult to save them from extinction, given the much smaller area and relatively smaller lion population," says the report. The WII suggested `preparing’ 400 sq km of the 3,700 sq km Kuno forest for the Asiatic lions. The Central government has accepted the recommendation. `Preparing’ this area for the lions means moving out villagers who live there and building up a `prey base’ for the big cats to feed on. The government has decided that around 7,400 people in 19 villages will have to be moved out to make way for the eight or so adult lions and their young, who will be brought here once the prey base is adequate. Several villages have been relocated outside the forest. 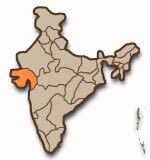 However, the Gujarat government is reluctant to move any of the lions out of the State. It wants the lions to remain uniquely `Gujarati’. "Rather than moving the lions so far away from Gir we are planning to shift some lions to Barda, a sanctuary near Porbandar," said Pathak. Gujarat’s Conservator of Forest (Wildlife) Pradeep Khanna said that an alternative location for the lions was not a good idea. "" he said. P.P. Rawal, Chief Forest Conservator of Gir, said relocation would only mean more inbreeding among the endangered sub-species. "There is already too much in-breeding. That is why 70 per cent of the cubs do not survive. You need at least 250 pairs for the survival of any species. Right now, we have only 92 males and 100 females in their reproductive years. What sense does it make to separate them further? We must first ensure they propagate and then let them disperse," he said. However, several wildlife experts disagree. Ravi Chellam said: "The Gujarat government has successfully increased the number of Asiatic lions. But we need to manage that success and think long term. It is better to avoid risk. How would it hurt if just five or eight adults are removed from the population? Their positions are misinformed. They say it is dangerous for the lions to be in tiger territory. But just eight tigers in Kuno pose no grave threat. The lions came to India and settled in the same north-central forests where tigers lived. They co-existed in the past, maintaining an uneasy truce. Lions live in the dry grasslands, whereas tigers move in the thick, dense forest." While the disappearance of India’s tiger population raises a national outcry, the gentler Asiatic lion’s fragile existence does not cause the same alarm. India has 3,000-odd tigers in 27 reserves. But there are only 327 Asiatic lions (according to the last lion census in 2000) confined in only one small sanctuary, Gir. The Asiatic lion (Panthera leo persica) is somewhat different from its African cousin in genetic make-up, skeletal structure and appearance. The Asiatic lion is smaller, has a loose fold on the belly, rarely seen in the African animal, and its mane is less dense. Asiatic lions were once spread across the Asia Minor and Arabia; they migrated to India through Persia. In the Indian subcontinent, the range of the Asiatic lions once extended across northern India, as far as Bihar and Orissa in the east, with the Narmada river marking the southern limit. Before the close of the 19th century, the Asiatic lion had become extinct everywhere except in Gir. The last lion surviving in the wild outside Saurashtra was reported in 1884. Ironically, one of the first to rescue the lions from extinction was a shikhari (hunter) - the Nawab of Junagadh, a princely state in Saurashtra. At the turn of the 20th century, he was shocked to find that there were only 12 lions left in the grassland. He declared a ban on lion-hunting and ensured that the big cats were protected. After his death, the British administration tried to control hunting in the forest. The first lion census was conducted in 1936, which put the estimated strength of the lion population at 287. The number dropped to 177 in 1968, because the animal’s grassland habitat was shrinking. In 1965, the government started the lion conservation programme and declared the area a sanctuary. Since then, the lion population has been growing steadily. A fresh census is now under way. Pathak explained why the lions managed to survive in Gir: "The last few lions remain in Gir because it is a compact, unfragmented ecosystem. And, since the time of the Nawab of Junagadh, there have been continuous conservation efforts here. Moreover, the local people respect nature and our staff work hard to preserve the forest." However, conditions for survival are not exactly perfect within the small confines of the Gir sanctuary. Five State highways and a railroad pass through the forest, which also draws 2.5 lakh tourists every year. The three big temples in the forest, which has 23 shrines tucked away amid the trees, draw more tourists than the wildlife safaris do. There is widespread limestone mining in villages just outside the sanctuary. There is a cement factory 15 km away from the protected area. This destroys the natural habitat and drains forest resources, including water, so precious during the dry months. Water holes within the sanctuary are drying up, pushing lions out in search of both water and prey. Watering holes are also places where it is easier to find prey like deer and the Nilgai. Recently, lions have fallen into wells in the villages on the outskirts of the forest. Instead of tackling these problems, the government is intent on getting rid of the Maldharis, local herdsmen who have co-existed with the lions in the forest for centuries. The Maldharis live in small settlements, each called a `ness’. There were once 129 nesses in the forest. The lions often prey on their cattle, but the Maldharis are not aggressive towards the animals. They accept it as part of nature’s cycle. The government offers them Rs.5,000 as compensation, but claiming it entails a long and tedious engagement with the bureaucracy. In 1972, the government tried to relocate some nesses outside the sanctuary. It shifted 580 of the 845 Maldhari families living in the forest. Though they were given land, the Maldharis did not do well as farmers. Many sold off their land. Today, there are 54 nesses (400 families) inside the sanctuary. Most Maldharis prefer to settle in the forest, even if it means living in small, secluded huts, without minimal amenities like electricity or water supply, and with poor access to markets, schools and hospitals. Dadhiya ness, which had 50 people, was shifted in the 1970s. Now only 12 families remain. "We didn’t go to the new land, only half our family moved out. The land they gave as compensation was stony, you can’t farm on that land," said Jaggo Ruda Jatwa. "We have 25 head of cattle, so we stay here. There’s nothing for us outside the sanctuary. What will we feed the cattle? We don’t know farming." Pathak says that shifting the Maldharis out of the forest will improve their quality of life and preserve the forest. "If they live in the forest, it degrades the habitat. Their cattle graze in direct competition with prey like deer." But experts question the Forest Department’s priorities. "Relocating the Maldharis is not going to solve the problem. It is more important to translocate the lions," Ravi Chellam said. "For the survival of the lions, the Maldharis are not an issue. Lions can coexist with humans. You need to be careful while relocating people. Wildlife conservation need not be purist." Both the Maldharis and the trackers, who live in intimate connection with animals, have detailed knowledge of the forest. A tracker who has known the forests long and closely said the lions would not survive without the Maldharis. "The Maldharis and their livestock are essential to the forest ecosystem. Yes, the cattle eat grass, but without their droppings, how will the grass grow? They are not competing for grazing space with other lion prey like deer, who mainly eat leaves." Ravi Chellam, however, believes that the lions can survive without the Maldharis. Lions started feeding more on wild prey (mostly the chital deer) after Maldhari villages relocated and livestock to prey on became scarce. "Over the years, the number of wild prey animals increased dramatically after some Maldhari villages were relocated and the national park was created. Gradually the lions have changed from being mainly livestock feeders to wild prey feeders." But the tracker insists that the lions prefer livestock even though there are so many more deer now. "After the Maldharis moved out, the lions also moved beyond the outskirts of the forest because there were more human settlements with cattle there. The last census found fewer lions in the core national park area than in the sanctuary surrounding it." Ravi Chellam says that the lions are moving out of the sanctuary because of a lack of space rather than food. As the debate continues on what is best for them, the kings of the jungle seem to be moving out to regain lost territory. If humans cannot make place for them, they seem to be carving out their own spaces, even on the beach. But that alone may not save the species. Some have to be moved much further than the beach.